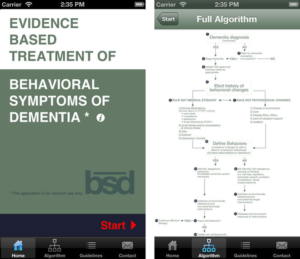 Dr. Gruss’s desire to translate research directly into the hands of geriatric clinicians led to development of our 1st app, the Behavioral Symptoms of Dementia software App (“BSD“). Dr. Gruss, along with a group of dementia care expert practitioners, developed an evidence-based algorithm for management of persons with behavioral symptoms of dementia (BSD). The BSD App has been downloaded thousands of times in 5 different countries.